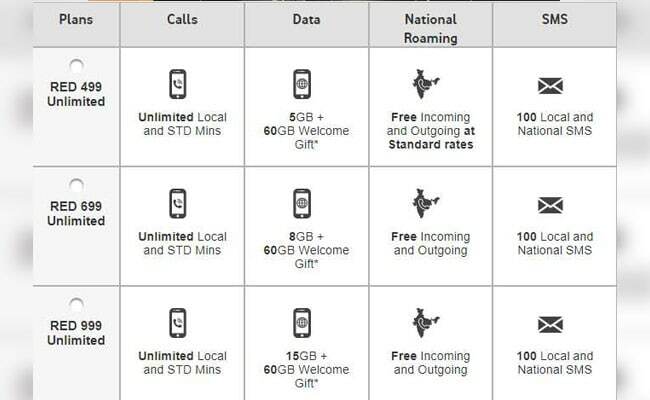 Vodafone India, in response to the onslaught of aggressive offers by Reliance Jio and Bharti Airtel, has released its own set of postpaid offers with a bumper 60 GB of bonus data free as a welcome gift to new customers. The offer, which is valid on all Vodafone RED postpaid connections, will be given as 10GB of free data every month for the first six bill cycles, the company website said. Vodafone Red plans start at Rs. 499 for which users will get 5 GB of data every month, apart from the bonus data. With low-cost data and bundled local and STD calls becoming the norm with Jio’s entry last year, telecom companies are looking to retain their market share by offering generous data and unlimited calling plans. Vodafone Red offers also give subscribers Netflix subsciptions on choosing the Rs. 1,299, Rs.1,699, Rs. 1,999 and Rs. 2,999 plan. While RED 1299 & RED 1699 will get 2 months of Netflix subscription, the RED 1,999 offer comes with 3 months of Netflix subscription and 12 months for the Rs. 2,999 plan. Vodafone’s Rs. 1,299 RED postpaid plan comes with unlimited calls on home network, besides providing free outgoing calls on roaming. It also comes with 100 text messages, and 20GB of bundled 4G/ 3G data for 4G smartphone users. Vodafone also offers a “Red Shield” service which allows subscribers to protect their smartphone from theft, physical or liquid damage and virus, at an additional price of Rs. 60 per month. Vodafone is set to merge with Idea which will create India’s largest telecom firm, eclipsing Bharti Airtel Ltd and pose a formidable challenge to disruptor Reliance Jio.